“Till” is based on a French song entitled “Prière Sans Espoir” with French lyrics by Pierre Benoit Buisson. 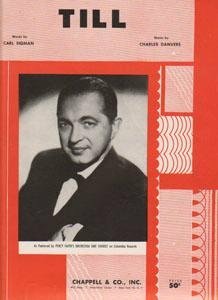 Percy Faith recorded the song in 1957. Other recordings include those by Tony Bennett, Shirley Bassey, and Bobby Vinton. Till then I’m yours, be mine. “Till” was recorded on November 11, 1959 and was released in 1960 on the album To My Wonderful One. It was arranged by Frank DeVol and produced by Mitch Miller and Al Ham.